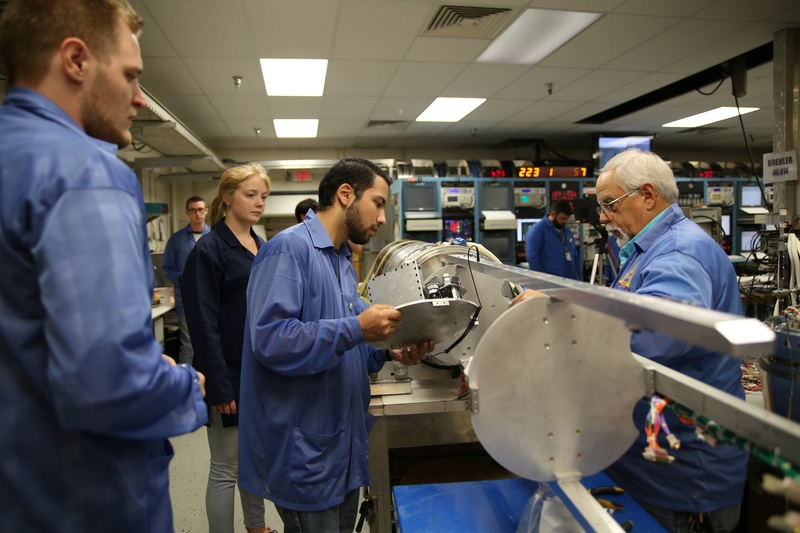 University of Nebraska – Lincoln student Firdavskhon Nasimov prepares to place the university’s student experiment into the RockSat-X payload at the Wallops Flight Facility. University and community college students will put their scientific and technological skills to test by flying experiments they developed on a NASA two-stage Terrier Improved-Malemute suborbital sounding rocket Aug. 16 from the Wallops Flight Facility in Virginia. The launch is planned for 6 a.m. EDT from pad two on Wallops Island. This will be the first mission from a new suborbital rocket launcher at the pad. The window is from 6 to 10 a.m. EDT. Backup launch dates are August 17 through19. Live coverage of the mission is scheduled to begin at 5:30 a.m. on the Wallops Ustream site. Launch updates also are available via the Wallops Facebook and Twitter sites. Facebook Live coverage begins at 5:45 a.m. The experiments are being flown through the RockSat-X program in conjunction with the Colorado Space Grant Consortium. Participating institutions in this flight are the University of Colorado, Boulder; Northwest Nazarene University, Nampa, Idaho; the University of Puerto Rico (UPR); the University of Nebraska, Lincoln; Virginia Tech University, Blacksburg; Capitol Technology University, Laurel, Maryland; Carthage College, Kenosha, Wisconsin; and University of Hawai'i Community Colleges at the Honolulu, Kapi'olani, Kaua'i, and Windward campuses. After flying to around 95 miles altitude, the payload, with the experiments, will descend by parachute and is expected to land 15 minutes after launch in the Atlantic Ocean, about 63 miles off the Virginia coast. The experiments and any stored data will be provided to the students later in the day following recovery. The University of Puerto has seen the value of providing students the hands-on experience through RockSat-X. "RockSat-X has become a fundamental part of the UPR students’ academic and professional development in the scientific research component. For five missions, this being the sixth, RockSat-X has encouraged our students to thrive and to put to the test their skills and creativity through the development of new, innovative and interdisciplinary payloads known for their highly complex systems that bring together STEM ideas into the space exploration community,” said Oscar Resto, Specialist in Scientific Instrumentation with UPR. Alexis Oquendo, UPR student in mechanical engineering, said, “Participating in the RockSat-X project has allowed me to develop my creativity and problem solving in the design of a payload that has a strong scientific research component. It has allowed me to earn real life experience in the aerospace field, working with guidelines, requirements, limitations and deadlines." Four community colleges in Hawaii have teamed up to encourage students to explore STEM-based careers. The experiment’s purpose is to demonstrate proof of concept for multiple experiments. The first primary experiment is to measure thermal neutron and gamma background radiation using scintillators and photomultiplier tubes. The second primary experiment will deploy a naphthalene sublimation mini-rocket made from 3D printed materials and capture imagery of the sublimation rocket’s release. The secondary experiments onboard will evaluate a 9-axis IMU motion tracking device and wirelessly transfer video from the sublimation rocket-mounted cameras back to the experiment. This experiment is aimed to develop and streamline the mechanism for a deployable boom and solar panel system. If successful, the deployable boom system could be used for suborbital and small satellite missions. This mechanism could also increase safety and ease of recovery for delicate deployed hardware. For the 2016 flight, this experiment will fly as a mechanical experiment only, in order to test the resilience of the retracted boom system. This experiment, TRAPSat, is using a silica aerogel to capture micro-debris. CTU is utilizing this RockSat-X mission as a proof of concept both for the use of aerogel as a medium to remove debris, as well as to prove the viability of using aerogel blanketing as an alternative to Multi-Layer Insulation. A camera will also be used on this experiment to image the micro-debris and thereby record data about their impact. Data from this mission will be used to improve the next iteration of TRAPSat before it flies on a NASA CubeSat in 2018. The goal of this experiment is to test the feasibility of flexible electronics in the space environment. Utilizing passive flexible radio frequency identification (RFID) tags, provided by American Semiconductor, recordings of temperature will be transmitted and received during the space flight. A boom will extend an RFID tag away from the experiment, during which temperature and transmit power will be recorded via the RFID reader powered by a smartphone. The boom deployment will also be recorded on a GoPro. The second part of the experiment is to utilize a microcontroller to facilitate the control and sampling of the American Semiconductor FleX-Analog to Digital Converter (ADC) accelerometer alongside a traditional ADC to compare the use of flexible electronics in space with standard off the shelf parts. This experiment will demonstrate the capability of software defined radio (SDR) in spaceflight communication systems. They also hope to show the possibility of using economically priced SDR devices such as the Ettus E310 that is being used in this experiment. Data will be transmitted to the Virginia Tech Ground Station using the Ettus E310 and a helical transmit antenna that deploys from the rocket in the direction of the Virginia Tech Ground Station. The transmitted packages contain gyroscope, acceleration, pressure and temperature data. The objective of this experiment is to observe very low frequency electromagnetic waves that come from lightning discharges. As the payload increases in altitude, the experiment will observe the impact that the ionosphere has on these low frequency waves. This experiment utilizes two electric field plate antenna pairs and three magnetic loop antennas (x,y,z-axis) with which to detect electromagnetic waves. The signals from the antennas are amplified and then stored onboard in an xCORE computer with microSD card. The experiment will allow the detection of high density particles found within 130-165 kilometers above Earth’s sea level, in order to study their physical and chemical properties. This objective will be met through the use of the UPR early micrometeorite impact detection system, collector, and various other measuring devices. This project could aid in developing a clearer image of space particles, and potentially lead to the discovery and subsequent genome sequencing of organic materials found within the aforementioned particles. This year, the UPR experiment focuses on cross-contamination mitigation through the use of plasma gas decontamination. The experiment is also utilizing a Leica SL UHD 4K video camera pointed aft to record video of the flight.